Atdec A-NC All-Purpose Mobile Notebook Cart for Notebooks up to 15.6"
Store & Protect Laptops up to 15.6"
Companies that depend upon notebooks up to 15.6" to conduct business will appreciate the sturdy and versatile A-NC All-Purpose Mobile Notebook Cart from Atdec. 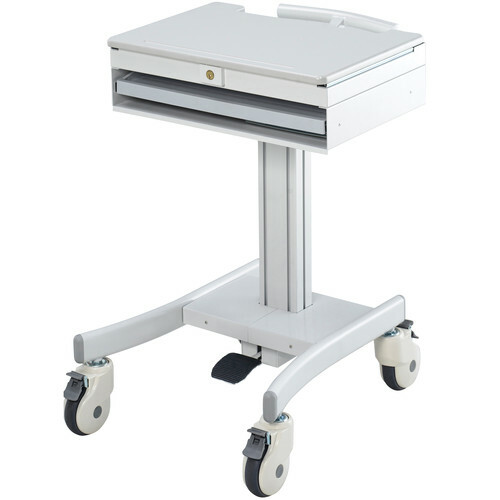 Fully-featured, the cart has a lockable compartment, as well as retractable keyboard and mouse trays. To keep cords neat and out of the way, there's a power supply and cable storage area. The cart has a 34.3 to 47" height range that may be adjusted with a gas-assisted pedal. Four large, locking casters and an ergonomic rear handle make moving the cart from place to place easy and stable. The casters have soft edges to protect floors. The top section of the cart features a work surface that slides forward to reveal a notebook storage compartment, which locks with a key. By securing your computer, you are also able to safeguard your data from prying eyes. The notebook may be used while in the compartment with the surface slid forward, or placed upon the surface, as a platform, with the surface slid backward. Underneath the top section are sliding keyboard and mouse trays. For strength and durability, the cart is made of steel, aluminum, and medium density fiberboard.